Buying a car in Japan is a daunting task. Or, to be more precise, selecting a make/model of car to buy in Japan is a daunting task. Considering only domestic (Japanese) cars, there are nine major makers (Itsuzsu, Daihatsu, Honda, Suzui, Toyota, Mazda, Nissan, Mitsubishi, and Subaru) representing an incredible 217 models (a stunning 69 from Toyota alone). Then there are about 15 major foreign makers, representing another 120 different models. To go along with all those models are a lot of different classifications. In addition to the normal sedan, SUV, wagon, minivan, and sports/specialty classifications are super-mini and “2BOX”. It turns out that the cars Fumie and I were interested in buying were in the “2BOX” class, although I have no idea what "2BOX' means. With so many models, names are, uh, “creative”. Some of the ones we initially considered included the Honda FIT, Toyota Corolla SPACiO, Toyota RAUM, the Toyota Corolla RUNX, and the Mitsubishi Colt (unrelated to the Dodge vehicle by the same name). Toyotas include a litany of names that would bring the best spell-checker to its knees, including the Toyota ist, Toyota WISH, Toyota Opa, Toyota bB, Toyota Brevis, Toyota Crown Majesta, Toyota WiLL CYPHA, and the Toyota Cami. The starting price tag of these Toyota cars (before options, etc.) range from under $9k (Toyota Vitz) to $100k (the Toyota Century). The ones we considered were in the $17k-$21k range. In the end, we bought a Toyota Sienta, and like it a lot. According to the old web site's “from the chief engineer” page, the name Sienta comes from the Spanish “siete” (“7”, as it can hold seven passengers) and the English “entertainment”. Ugh. The car is much nicer than its name entomology etymology. Hey Jeffrey, I’m considering getting a Sienta. Have you had any major problems with it? Does anything annoy you about it? How spacious is the back seat and boot/trunk? I have a Sienta which I actually brought back to the UK when I left Japan last year. We had it when they were first released (Oct 2003) and it’s been great. The boot is a good size when the back seats are folded away (I regularly used to transport a drumkit around in it). With the seats down it’s not giving you huge acres of space but we’ve driven fair distances with all seven seats occupied and little moaning. Obviously it’s better as a family car with kids in the back. Probably not optimum for transporting a seven man wrestling team. Hmmm…..we might go with an Edix or Stepwagon now. 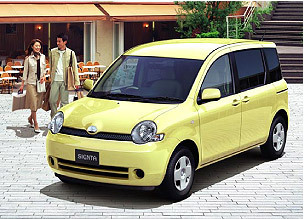 The Sienta looks interesting, but we don’t want to stuff the kids in the back in case there’s an accident or something. Cars are just too expensive here in Singapore especially since they jack the price up 15% to 25% above cost! I’m hunting around like mad too… all that new age MPVs coming out like Sienta, Airwave, Edix, Lafesta, Colt, APV, etc… it is very very difficult to make the decision. However I’ve been thinking long enough and I think 80% is slanting to Sienta’s side now. Reason is I like the option of having 2 extra seats behind for unforeseen occasions. I can fold down when I don’t need them to hold my golf bag. But any problems mechanically or under power? Please comment without biase. It’ll help a lot to finalise my decision. Thanks! |> biase. It’ll help a lot to finalise my decision. Thanks! price of car? It’s certainly very high on the value scale. we’d pick the lowest. We got a huge discount that way. I ended up getting the new Santa Fe 7 seater. A bit squeezy in the last row, but usually we stick the nieces/nephews in there. But I’ve seen a lot more Sientas on the road here in Singapore. I think the last price I saw for it was around 59k SGD. I saw a few that had curtains/blinds. Pretty cool. Just bought a new(old) 2004 Sienta (demo model here in HK, hence a couple of years old but still new) for about 20K USD. Great car. Luckily bought it from a HK dealer that specializes in interior refits so this Sienta has a handsome beige leather interior and nice sport rally wheels on it. Looking forward to low fuel usage with maximum people carrying capability! Japanese car names can indeed by quite wacky… I was going to start listing some of my favorites, but searching for information on the Suzuki Every Wagon Joypop turned up the old Metropolis article What’s in a name?, which covers most of the good ones. Interestingly, as of 1-2 years ago, the Fit is available in the USA now.